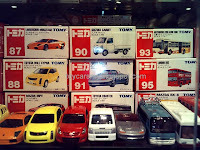 My colleague sent me this pictures from oversea, as you can see there are a lot of the models not available in Malaysia. 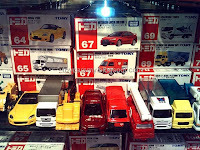 From the famous Civic Type R, Mitsubishi Evo X, Hammer H2 to some discontinued models. 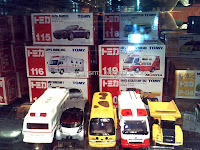 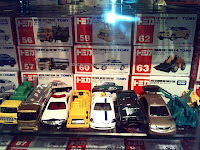 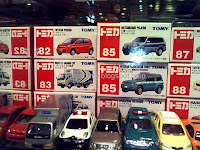 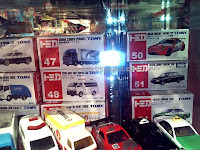 For Pro-Tomica collector will notice some of the models are with same number, this is due to the newer model cars already replaced older model with the same number, example, there are two different boxes for # 85 Mitsubishi Pajero and # 99 for both new and old Toyota Estima. 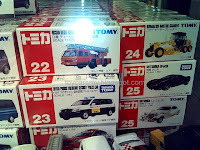 Some boxes are still labeled under Tomy and some are with Takara Tomy, and this will be slowly replaced my new name, Takara Tomy after the merger on March 1, 2006.
well, indeed lots of choices. 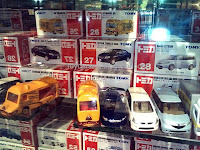 i guess there are no people who sapu or filtered hot models like the evo x, type r civic and the suzuki swift. 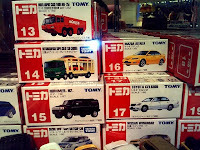 Hi, I am collecting Tomica too. 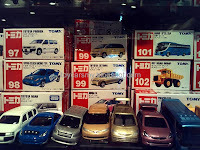 Can you give me info where I can get Honda CRV (Red color)? 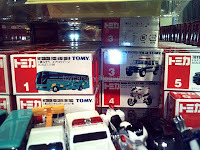 Thanks bro..